This time the brand has pleased its fans with novelties from the Charms Extraordinaire collection, presented at the Geneva exhibition SIHH 2013. It should be noted, that the collection has been updated, it was first introduced in 2008. The models from the Charms Extraordinaire collection embody old tradition of jewelry and watches at home. These are elegant watches with unusual dials. 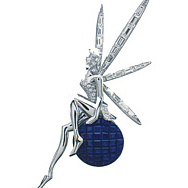 On the one dial is depicted a winged fairy - a symbol of home, (model Féérie Dandelion). Fairy is made of gold, her face - of a diamond, and the wings - of enamel. Dandelion is made of gold and diamonds. The dial is inserted in a 38 mm round case made of white gold with diamonds and sapphires. Another novelty of this collection - Muguet, is another fairy picture, next to which a butterfly and lily of the valley. Miniatures are made on the mother of pearl dial. The case of this watch is made of white gold, its diameter is 38 mm. The case is decorated with yellow sapphires and diamonds. The elegant model Lotus, featuring a lotus flower, supplements the Charms Extraordinaire collection. The outlines of the lotus in the technique of champlevé are transmitted by light. Champlevé is a technique of enamelling in arts and crafts or on its object, follow the following process: cut cells on the surface of metallic object filled vitreous enamel, which after firing polished. Do not cut out of the surface of the structure remains visible the shapes of enamel; on ancient medieval works, they usually were gilded. The model is presented with the image of a lotus in a 32 mm case, which is encrusted with diamonds, sapphires, and tourmalines. The spirit of spring feels in the new collection. Swallows on dial of the Hirondelles watch resembles the spring’s arrival. One of them is sitting on a branch, the other - spreading her wings, flies to the first. The birds are depicted on a background of blue sky and orange-pink flowers that convey the fresh smell of spring. The novelty, too, has a 32 mm case in pink gold with pink and purple sapphires and diamonds. Official site of Van Cleef & Arpels.